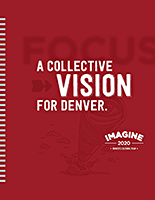 IMAGINE 2020 In Action - Stories from our community partners from Denver Arts & Venues on Vimeo. THE IMAGINE 2020 ANNUAL REPORT FOR 2016-2017 IS OUT NOW! Download the electronic version below. 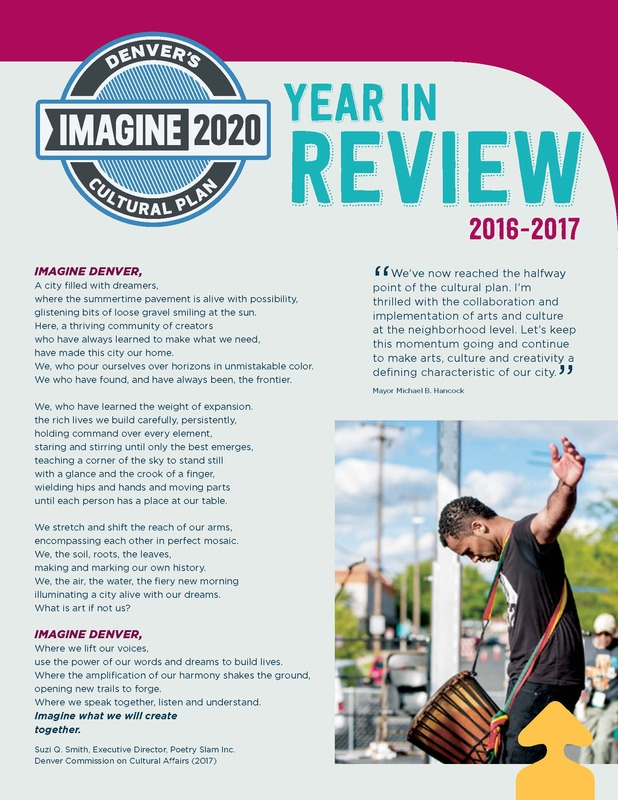 In Spring 2013, Denver’s community gathered to provide a strategic vision and future platform for arts, culture and creativity in the City that became IMAGINE 2020 - Denver’s Cultural Plan. 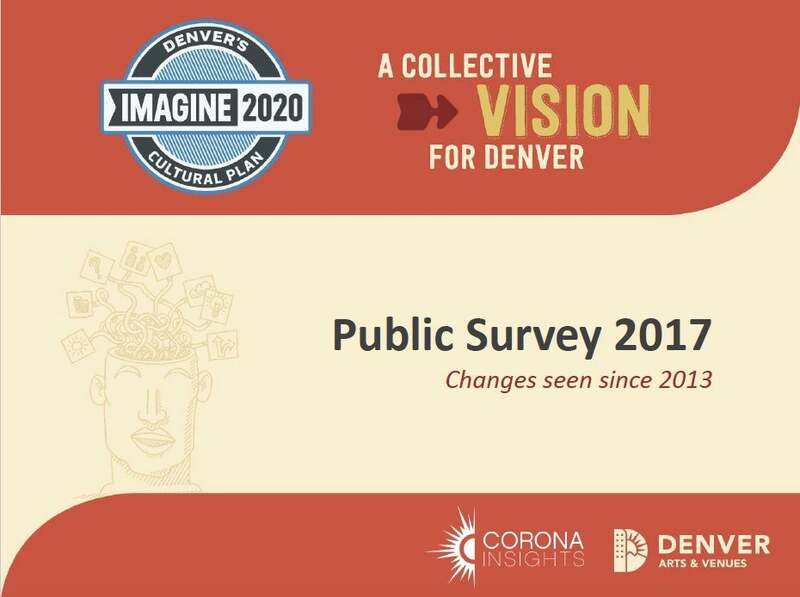 IMAGINE 2020 is Denver’s first cultural plan since 1989 and reflects the vision, goals and aspirations of everyone who contributed ideas through the planning process and will help guide resources, support and direction for the City’s arts and culture in all their many forms. It makes a call to action to city agencies, cultural institutions, businesses, civic leaders, neighborhood- and community- based organizations and residents to ensure arts and culture are at the heart of this great city. The following documents will provide greater detail on how IMAGINE 2020 was developed, the full plan including the seven vision elements and priority goals and a look at implementation over the next seven years. 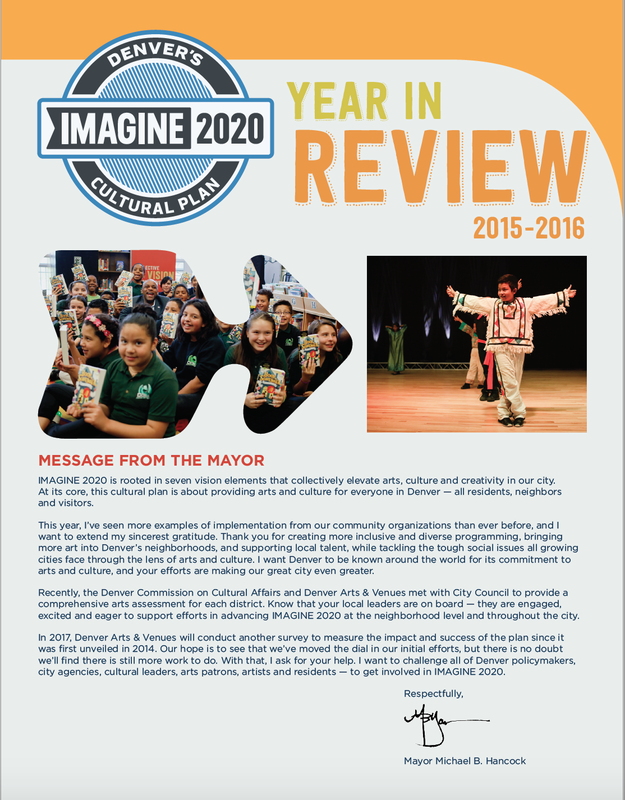 in support of IMAGINE 2020's goals, Denver Arts & Venues offers several funding opportunities to support your programs. Integration: Arts, culture and creativity are fully integrated into daily life, work and play in Denver. Amplification: Arts, culture and creativity are amplified in Denver - and amplify the city to the world. Accessibility: Arts, culture and creativity are truly inclusive and accessible for all. Lifelong Learning: Exposure, appreciation and participation in arts, culture and creativity span our lifetimes. Local Talent: Denver's diverse artistic and creative professionals are locally cultivated and flourishing. 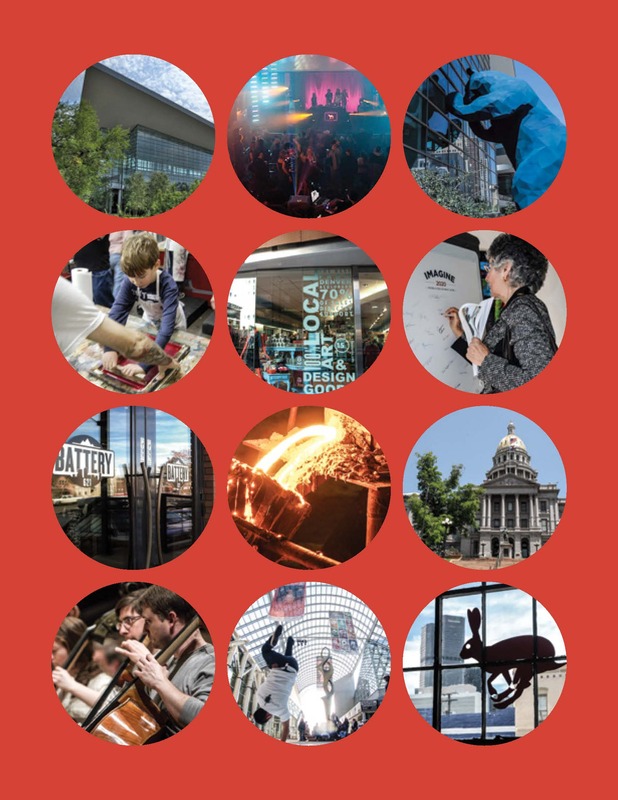 Economic Vitality: Denver's economic vitality is accelerated by arts, culture and creativity. Collective Leadership: Collective leadership is committed to high impact results across Denver. Here's a look at the progress we made in the first years of implementation. 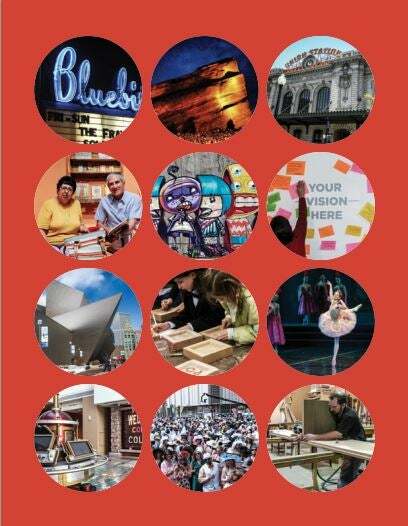 With your help we anticipate even greater strides for the future of Denver's Cultural Plan. Now in its eleventh year, UAF is a graffiti prevention and youth development program which facilitates the creation of new murals in perpetually vandalized areas throughout the City and County of Denver. More than 4,000 Denver youth and community members have participated in the development and installation of over 300 murals, abating over 450,000 square feet of walls from vandalism. Through the Denver Music & Community Strategy, this fund aims to support programs and initiatives from representatives of the music ecosystem – musicians, businesses, government, nonprofit leaders, educational institutions and individuals – that highlight the important role music plays as an agent for innovation, community building and positive social change in the City of Denver. Visit Denver Music Advancement Fund Page. Now in its fifth year, the I2020 fund supports and generates awareness of programs that take action on one or more of the cultural plan’s vision elements. These are: 1) Integration, 2) Amplification, 3) Accessibility, 4) Lifelong Learning, 5) Local Talent, 6) Economic Vitality, and 7) Collective Leadership. Since 1986, the Mayor’s Awards for Excellence in Arts & Culture have annually recognized individuals and organizations that make significant and lasting contributions to the arts in Denver. 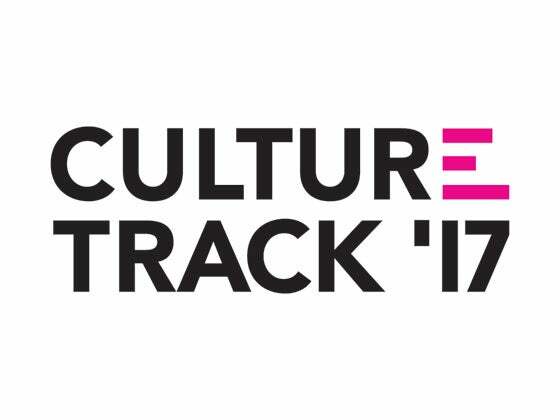 Awards include the Arts & Culture Youth Award, Arts & Culture Impact Award, Arts & Culture Global Award, Arts & Culture Innovation Award and the IMAGINE 2020 Award. In 2019, Arts & Venues will award a $1,000 stipend to the winners in each category. Now in its sixth year, PSYAH is a citywide creative placemaking and neighborhood revitalization initiative that cultivates collaborative, community-led outdoor projects in Denver’s public spaces. PSYAH funds help support creative, short-term physical improvement projects that aim to transform our underutilized urban spaces to increase collaboration, honor heritage, build civic engagement, beautify neighborhoods, enrich communities and inspire long-term change. IMAGINE 2020: Denver's Cultural Plan, Official Video from Denver Arts & Venues on Vimeo.